When the idea for a winter scape comes to mind for our area, creating a snow scene seemed somewhat alien. However winter does bring snow, frost and ice down south in the higher mountain ranges and also in Antarctica, part of which is Australian Territory. 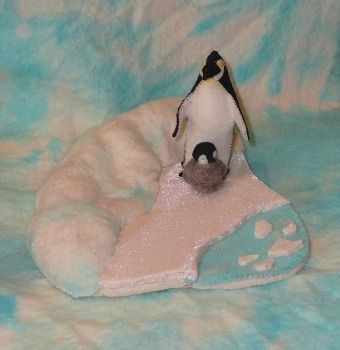 Because this piece was a commission for a recipient fascinated by snow and penguins the idea of trying to create a scape representing Antarctica seemed feasible at first, even easy. As it has turned out this has been one of the most difficult projects so far attempted. White and lots of it is flat, dull, uninspiring. The challenge to encapsulate the essence of a continent covered in snow and permafrost, barren to all appearances yet vast, wild and home to millions of sea creatures was both exhilarating and daunting. Such an extreme and beautiful place had to be reduced to a very small scale with the added restraint of using warm, wool felt to portray this freezing climate. It seemed a crazy and impossible notion. Using pure white just did not work, nor did some of my original ideas. Instead of a flat base this piece required sculpting from very hard industrial felt that resulted in bleeding fingers. For some time nothing worked and it was poked away . The breakthrough came when my friend Mia bought some of her wonderful splotchy felt that she hand dyes to craft. Splotchy felt is perfect to use for water. As I placed a piece down to make the sea it seemed that it could create a cold effect when used in the scene. This lovely felt was the missing link and helped to give the illusion of shadows and crevices, as well as to introduce the blue tones connected with the continent. Even so the scene was still dull and lifeless, requiring the glisten that snow has as the light dances over it. This came through using a shimmery organza to make an ice sheet with sparing application of silver glitter. Iconic Emperor Penguins were used to represent the species that use this incredible area to raise their young. As the Emperor penguin is found over the entire continent it seemed the right creature to place in this setting and to also indicate that even in such a harsh environment life can exist. This environment is fragile and threatened. The ice cap is melting because air and sea temperatures are rising. As a consequence so will sea levels. This will have a far ranging impact on other continents as well as the potential for many species to face extinction. Antarctica is a place that has attracted and fascinated scientists for many years with considerable research being undertaken. Let us hope this is not in vain and the warning signals will be heeded and, more importantly, that significant action is taken immediately on a global scale. I so love those penguins. More than once I’ve thought of them as I sit gazing into my bee hive. All those bodies working together to warm the babies. I don’t know how many times I’ve watched that movie narrated by Morgan Freeman and amazed anew every time. I so picture that little bit of penguin sliding right down to the sea when it comes his time.